It’s easy to head to Las Vegas and want to have the very best when it comes to hotels and restaurants, but let’s face it, the very best costs too much money. So, the next best option is to find a hotel within your budget that gives you the maximum amount of amenities for the minimum amount of money. In this case, the Flamingo Las Vegas is a great deal for a hotel for a Las Vegas vacation that has some budgetary limitations. It is not cheap, but relative to Las Vegas hotels, it is affordable and an impressive value for what you ultimately get. In the not-too-distant-past, the Flamingo had some really old rooms that were not worth staying at. I can’t lie about how bad they were but that is all in the past as the entire property has undergone a massive renovation and now you can find some of the best mid-priced rooms in all of Las Vegas right in this center Strip property. The Go Rooms and FAB rooms are about as good as you can get along the Strip and the price for these rooms, which include pillow-top mattresses, will make your budget-minded travel brain very happy. The best part of this hotel for budget travelers who happen to have their IDs with them is The Beach Club Pool. This is the best family-friendly pool on the Las Vegas Strip. It offers a large pool for swimming as well as a water slide. The Wildlife Habitat is a free attraction on the property where you can see actual flamingos as well as various species of birds, fish and turtles. You can listen to some of the animal handlers as they fill in visitors on the details of the wildlife or you can watch the daily feedings if you need more entertainment. Donny and Marie, Legends in Concert, X-Burlesque, and Vinnie Favorito all perform nightly, and these shows are among the best priced entertainment on the Las Vegas Strip. The showroom is located right on the casino floor and the entertainment starts in the afternoon and goes clear though until the early morning hours. Short on cash, but hungry? The Flamingo has a food court that can take care of all of your meals. The assortment of fast food restaurants and snack shops are all reasonably affordable and conveniently located right off the casino floor. If you are a Jimmy Buffet fan you will love Margaritaville as the Parrot Heads all congregate here daily and the food is worth a visit. Grab a boat drink and listen to the music in this spot where atmosphere is more of a draw than the actual product coming out of the kitchen. Carlos ‘n Charlie’s is an outpost with roots in Mexico and you can bet that some of the crazy fun you have heard about on Spring Break can be found here. The back patio is a fun spot to have a little Mexican party and the margaritas and tequila shots flow freely. 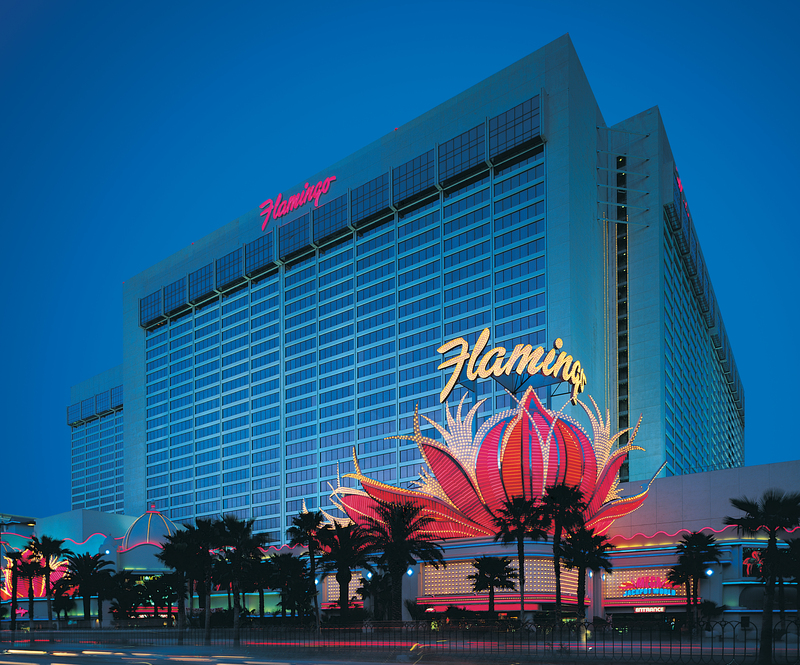 Want to book the Flamingo Las Vegas? Call us at 702-448-6900 or fill out this form with your requested dates and we'll get you booked for less.